Tea brewing doesn't need to be complicated, and there are plenty of easy-to-use tea accessories and infusers to make it as simple as possible. All it really takes for good tea is some tea leaves, hot water, and a cup to brew in/drink from. In many parts of China, people simply add quality leaves* to a glass of hot water and drink. You can easily brew and drink tea at home with this simple, utilitarian method, or with a whole range of other simple tea equipment. The main pieces of equipment to consider are the means for heating water, the infusion tool, the drinking vessel and the storage equipment. Beyond these tools, other accouterments are purely optional. *Quality leaves tend to sink in the glass, making this mode of tea consumption easier (and more enjoyable) than it would otherwise be! You can warm tea for water with nothing more than a watchful eye, a heat source and a simple pot or ​stove-top tea kettle. Some tea lovers prefer this method because it creates more of a 'ritual' to tea consumption. Aside from low-quality teabags and the 'just drop leaves into your cup/bowl' method, these are the five easiest ways to infuse tea. Teapots with strainers also make brewing tea simple. Be sure to ask your tea vendor about the best teapot for you before you buy, as some teapots are best for brewing particular types of tea than others. 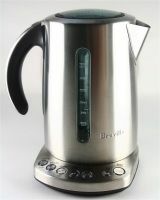 You can also heat water and infuse tea with one tool, thanks to (super-easy) equipment like the Breville One-Touch Tea Maker. Are white on the inside or clear; this helps you appreciate the color of the tea. Are thin-walled; this feels better in the hand and against the lips. Retain heat well; this keeps your tea hotter longer. Are smaller than your average mug; this helps you focus on the taste of the tea rather than chugging it down before it gets cold. If you're consuming your tea fairly quickly (within a few months), you may be able to store it in the packaging it came in. However, if your tea came in less-than-functional packaging or you're planning on hanging onto it for a while, you may want to invest in tea tins or other storage equipment. This article on how to store tea includes all the basic you'll need to know for selecting tea storage equipment. Beyond these basics, there are all kinds of optional tea accessories. Depending on your brewing style, you may want to purchase anything from a gong fu boat to a silver tea service tray. Let your personal tastes guide you to select tea accessories that suit your lifestyle and aesthetic preferences. Don't Use Boiling Water and Other Tips for Making Perfect White Tea? What Detox Tea Also Tastes Good?